Traditions regularly weave their way through our lives, being passed from one generation to another without written instruction, following what those have done for ages before us. Some of these we enjoy, others not so much. One beautiful Dutch tradition takes place on birthdays and is usually orchestrated by your immediate family members. On their birthday, the person is celebrated with their very own flower chair, when it is tradition that the family decorates a chair with seasonal flowers, paper streamers, paper flowers and balloons. It is customary in my friends' family to use fresh flowers only, taken, of course, from their very own cutting garden. I had a hand in helping to continue this celebration once, first harvesting any blooms we wanted to use from the garden, keeping in mind to choose flowers that have longevity and that would not wilt immediately or stain clothing. To create the chair a base of grapevines, sans leaves, were weaved through the frame of the chair, which was used as the anchor for the rest of the blooms and foliage that were to follow. 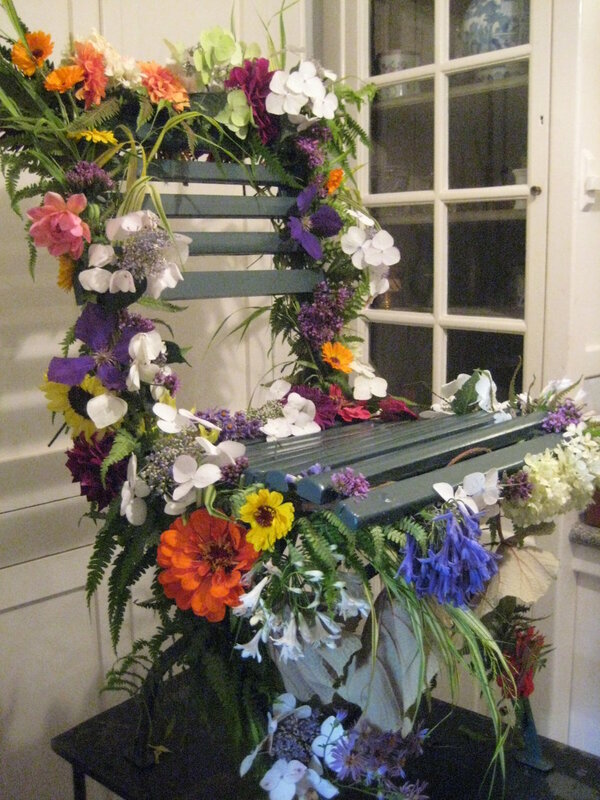 The more densely packed the chair became, the easier it was to insert more flowers, from annuals to perennials, grasses and foliage, we piled it on, barely leaving a place to sit. Once finished there was no denying the smiles this seat elicited from the birthday girl and the others in this wonderful Dutch celebration. Gelukkige verjaardag! Jul 11 An affair to remember..